Thanks to all my buddies out there who have e-mailed mom asking where the heck we've been (and if we're okay)!! Everything's good, mom is just taking a break from bloggin right now. We hope everyone is having a great Holiday Season!!! We miss you!! Heehee, espically I miss Mack! Thanks for checking in, little dude, was getting kind of worried. Thanks for letting us know! Happy Holidays! Happy Holidays to you!!!! So happy you're all doing well ; ) ! Wow, it's great to hear from you. Happy holidays to your pack. WHEW!!! I was really getting worried. Happy Holly Daze to you and your peeps. Thanks for letting us know. We've missed you, but this is a furry, furry busy time of year!! We've had the same post up for over a week! Glad everything is okay, and we hope we will see you soon! Great hearing from you! We were wondering where you've been. Glad everything is okay. We hope Santa is good to you, Mack! I khan refluff my tail again! Happy to hear all is well, we worry when we don't hear anything. Happy Holidays to all of you from us. Glad all is well and that you are enjoying the holiday buildup. We, too, miss you and hope you will be back soon. 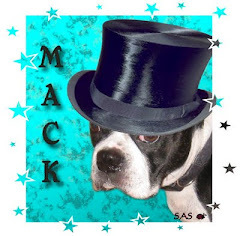 Our calendar says that today is your birthday, Mack! Happy birthday! We hope you have an awesome day buddy! Glad to know you are doing okay. May your New Year 2012 be blessed with peace, love and happiness. Sending our heartfelt wishes with joy that never ends. Please come bac k son. We miss ya something fierce. Hope all is going well. Miss you guys. this post reminds me of my old room mate! We can't find your e-mail address and Mommy wanted to let you that Momma Tea from the Kresty Krew is here from England & we're trying to gather up some Texas bloggers for a visit dogs included. i was shock and heart broken few months back when i found out my husband cheating was on me with with some from hiswork We’ve been married going on 4 years. 2kids. lots of amazing moments together. i want to leave, but i love him so much.he has to see her everyday because they work together. we are both still young and very attractive. but i want my husband, my only friend, and the father of my beautiful children. how do i get past the thought of another woman having taking my husband from me? Not my fiancé, not my boyfriend, but my husband! i still love him even though he thinks i want to leave i really want him to do better and stop me before i walk out! my husband told me that he doesn’t feel loved anymore, just because of lady he is seeing at work... and he wants a divorce, i was devastated, heart broken i begged him to listen to me that we can work it out like we always do, but he didn’t listen, he told me that he met someone that loves and understands him, i begged him to consider our kids but he’s did listen. he left and i was frustrated, i began searching for help and answers, then i good testimony about a man that can Cast a spell to remind him of all the things we have been through together and make him fall 100% in love with me again, at first I was scared but i decided to give it a try, and like magic my husband is back to me, apology and begging for forgiveness,my marriage is save and my husband is showing me love more then ever before, happiness is back in my home all thanks to this Genuine man prophet ogidi of MIRACLECENTER110@GMAIL.COM.